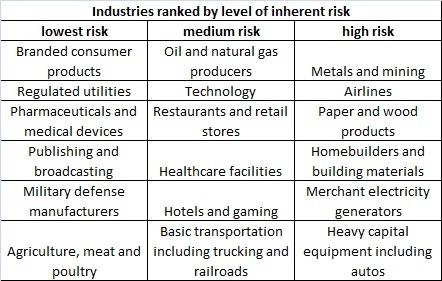 Industry risk is the risk of losing revenue or market share or incurring an overall financial decline as a result of industry changes, business cycles, product obsolescence, changes in consumer preferences, changes in technology, reduction in barriers to entry, or an increase in competition. The credit analyst must understand industry dynamics and trends in order to accurately assess the risk. In the early 1900s, the horse carriage making industry was thriving. However, even the best horse carriage maker would go out of business because the automobile made the industry obsolete. A more recent example is the telecommunication services industry in the late 1990s. As Internet usage grew at astonishing rates, capital flowed to start-ups that built new telecom networks throughout the US. Although Internet traffic continued to grow at high rates, the barriers to entry were low, and thus too many companies entered the market and drove prices down due to overcapacity. Many of these companies were not able to make any money and eventually folded. This table only serves as a guideline since industry structures change all the time based on the economic and competitive environment. In the late 1990s, many retailers went out of business because the country was over-stored with too many shopping malls appearing throughout the country. The fierce competition drove prices down and pressured the retailers already thin margins. Only the most efficient or best positioned retailers escaped bankruptcy. In the early 2000’s, the highest risk industry was telecom service providers. As internet usage grew, capital flowed into start-ups to construct new networks. Although internet usage grew at high rates, network capacity grew at even higher rates and eventually pressured pricing. Most of these start-up networks did not survive. In contrast, retailers performed well during that recession because retail square footage had been taken out and low interest rates and rising home prices kept the consumer spending. In the current 2008-2011 downturn, financials, autos, and home builders have felt the greatest stress due to the bursting of the housing bubble. We have seen Lehman Brothers, Washington Mutual, CIT and MF Global all go bankrupt. In autos, General Motors, Lear and a host of other auto suppliers filed for bankruptcy. Using this framework to analyze the industry, you can assess the industry’s health by examining the potential threats and structural changes. This can be helpful in determining the company’s credit risk.